Doubles was the theme of Wednesday with three doubles matches taking Stadium Court. With organizations such as ALTA and USTA, the popularity of doubles in the Atlanta made up the excited sellout crowd. Plus it helps when the line up features Mardy Fish, Andy Roddick, and Mike and Bob Bryan. The evening started with Roddick and Fish taking on Yen-Hsun Lu of Chinese Taipei and Great Britain’s Jonathan Marray. The American duo had nothing but confidence on their side, entering the match with a 19-6 and two titles under their belt. Roddick and Fish were looking to earn their first win together since Basel in 2011. As expected, the former No. 1 Roddick came out with his still booming serve, notching speeds as high as 130 mph. Each player would maintain their service holds until a first set tiebreaker was forced. Due to the swift net play of Fish, the Americans were able pull away, 7-6(2). The second set began with Marray having issues finding his serve. This would lead to an early break for Roddick and Fish, another level of rhythm, and eventually taking the set and match 6-4. After the match, Roddick took time to thank the crowd for all the support, not only with his play here in Atlanta, but with his expecting of a child. Fish, who is on his last run on the tour and will retire at the U.S. Open this fall, went on to say how special of a place Atlanta is. Both players have history here winning singles titles respectively .The pair will now face American Eric Butorac and Artem Sitak of New Zealand. 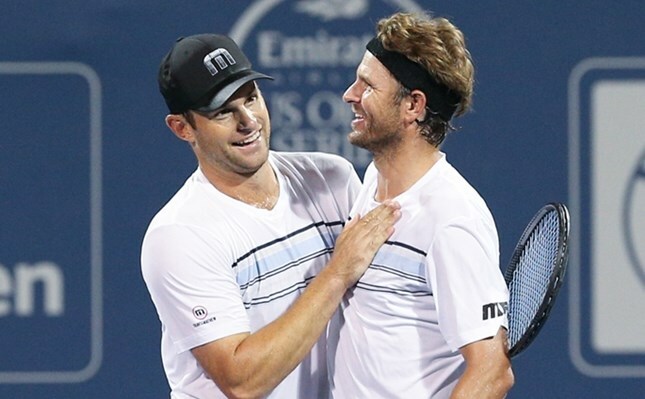 Following the Roddick and Fish match, the No .1 doubles team in the world made their BB&T Atlanta Open debut, taking the court to face off against Sam Groth and Chris Guccione of Australia. With 16 Grand Slams and 106 Career titles, they showed exactly why they are the most decorated duo in doubles history, easily taking the match 6-2 6-1. The match only took 45 minutes to complete. Though the Bryan Brothers were in top form, it was easy to see that Groth was struggling with some fatigue, having just come of the court a few hours beforehand after losing to Marcos Baghdatis. The Bryan brothers will now take on Trent Huey and Steve Johnson.